Another festival another traffic jam. That seems to be the trend this year: stuck in traffic for Pinkpop, Rock Werchter and now North Sea Jazz. But after some driving around we somehow managed to park our car and it was time to meet our friends and to check out the performances. We wanted to start it off with the Chucho Valdés Big Band but...the hall for this performance was full. So we improvised and went to see the John Taylor Trio instead. A piano trio can be really exciting but this wasn't. Everything was on the safe side and the musicians didn't really challenge each other. Of course John Taylor is very good piano player but it could have used some more fireworks. So no suprises here and we decided to try to see Kyteman but...the tent was full. So it was time for a bite to eat and a drink or two. 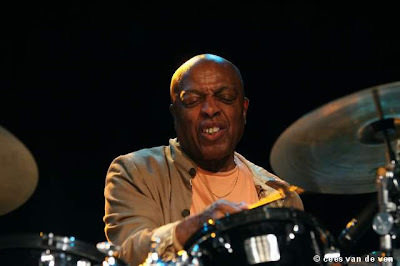 I had to choose now: Roy Haynes or Antonio Sanchez with the Scott Colley Quartet. I decided to see Roy Haynes and quickly we made our way there so we wouldn't be too late again! What was missing with the John Taylor trio earlier was all here. Of course Haynes had David Kikoski on piano and John Patitucci on bass to help him. Nice compositions, very good musicians of course and now and then some exciting interaction. Haynes showed why he's considered a living legend and challenged the others to play their best. Michiel Borstlap playing Monk should be good. With Han Bennink on drums this is bound to have some good moments. Bennink crazy as always used the whole stage, including his shoes to play his rythms. And Borstlap was playing the Monk tunes in his own relaxed style. You can't go wrong with Monk. I liked his latest album "The Way I See It" but this gig didn't do it for me. The sound was just awful and the music didn't sound as good as on the album. Maybe just not my cup of tea. 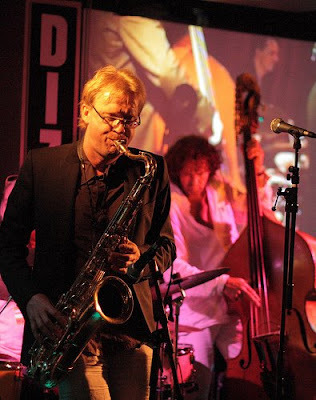 I went to see this quartet because Martijn Vink is playing the drums in it and I wanted to check him out. I didn't know the others but was pleasantly surprised. They played some complex songs together, some bop inspired and some more easy and mellow songs. Now and then Blom would come to the mic to introduce a song or make a joke or two making it a very vibrant and entertaining permormance. I'm definitely gonna check out their album "Statue of Liberty". Of course when I get the change to see artists like Steve Winwood I make sure I grab it. He was playing several of his hit songs including "Higher Love" and some Clapton songs that were really lacking Slowhand himself. Winwood has some very good musicians playing with him but I still felt like something was missing. Could've been the stage in the very large Nile hall with bad sound again. Or maybe my expectations were too high. 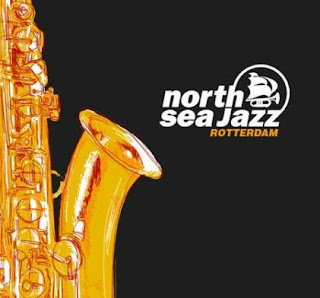 I have mixed feelings about this North Sea Jazz edition. It was just too crowded at times which kind of takes away some of the fun to discover new music or to make it to a performance on time you were really hoping to see. Then again I also saw some great music played by great musicians and had a good time with my friends. So I still went home happy. Maybe next year we're gonna give The Hague Jazz a try?